Looking for a great place to network on the Eastern Seaboard in a friendly social environment? 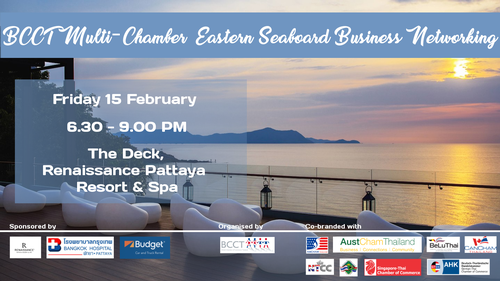 Then come along to the Eastern Seaboard Multi-Chamber Networking event in Pattaya. The event is hosted by the British Chamber of Commerce Thailand (BCCT). Transport: BCCT is organizing transportation, leaving from Bangkok at 3.00 pm (sharp) to Pattaya and returning the same night after the event. To book, please send an email to urosesri@bccthai.com before 5 pm on Wednesday, February 13. Cost is THB 500 per person. Accommodation: Special room rates at Renaissance Pattaya Resort & Spa are available at 4,000 Baht++ (Deluxe Single) and 4,400 Baht++ (Deluxe Double). For reservations, please contact Khun Patchayapa at Patchayapa.w@renaissancepattaya.com or call 038-259-099. Booking deadline: February 14, 12 noon. Baht 500 for members of participating chambers. Baht 1,000 for non-members. NO NON-MEMBER WALK-INS.